- Upgrade VDP, add 128Kb videoRAM. - MSX2 BIOS (would probably need patching). - A floppy controller/drive and disk BIOS. - Memory mapper / RAM expansion. Am I missing something? I have a broken SVI 728 (broken case, broken keyboard, broken PSU board...) that I'd like to do something with. Yes, I know it's easier to just buy an MSX2, but I'm doing this for the challenge and not to save money. You probably need to add an internal expander. I recommand the use of an EPM for expander, mapper and glue logic. Check the requirements in the MSX2 technical data book. The disk controller is not required, for instance. RTC is not optional even if it not necessary for games. By cons the floppy drive is. You can put an adapter to flash card instead. Check out fzanoto's MA-20 clone project, it's open source. The cartridge uses an Altera CPLD for the glue logic and a few other ICs for things like composite out, 512kb memory mapper and MSX2 ROM. It's definitely the "cleanest" MSX2 upgrade i've seen. I'm guessing the Altera chip is what Fabf referred to as an "EPM" since the model is "EPM7128"
@skumlerud: The SVI-728 doesn't have any internally expanded slots. This means it only has 4 slots available. The internal ROM occupies slot 0, while internal RAM occupies slot 1. 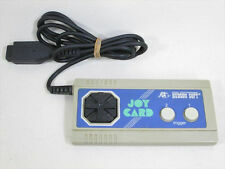 Slot 2 corresponds to the top cartridge slot, and slot 3 is the bus expansion in the back. MSX2 usually have at least one internally expanded slot and the MSX2 SubROM (its BIOS and BASIC extensions) resides in one of those slots. The Panasonic FS-A1F, for example, has slots 0 to 2 unexpanded (0 has the main ROM, 1 and 2 are cartridge slots), but slot 3 is internally expanded to accomodate the RAM (at slot 3-0), the SubROM (at slot 3-1) and internal software (at slots 3-2 and 3-3). This is a fairly common setup. But in your case, if you never use the expansion bus, you could put the SubROM there (at slot 3). I'm not 100% sure this would work but at least it would be simpler to do.